Ayatollah Khamenei says Iran should be ready to increase enrichment if the nuke deal falls apart, and vows that Iran will continue to develop missiles. 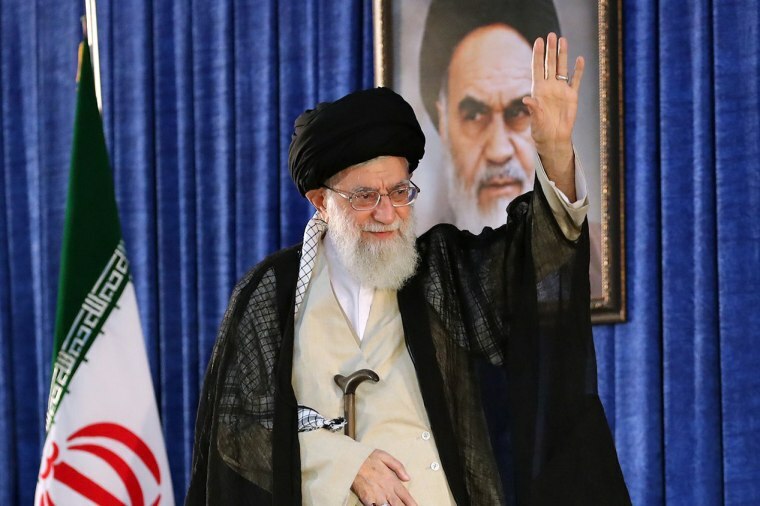 Iran's supreme leader said Monday that Iran will not relent to U.S. pressures on its nuclear program, ordering Iranian scientists to get ready to increase uranium enrichment capabilities if necessary and vowing that Iran won't give up its missile program. In a speech and series of tweets marking the 29th anniversary of the death of Ayatollah Ruhollah Khomeini, Ayatollah Ali Khamenei said "the Iranian nation and government will not stand being under both sanctions and nuclear restrictions. … The Atomic Energy Organization of Iran must immediately make the preparations for achieving [increased enrichment.)" But Khamenei, speaking at Khomenei's tomb in South Tehran, was careful to note the proposed increase in enrichment capabilities would still fall within the limits specified in the 2015 Iran nuclear deal, and that Iran plans to stay in the deal. Via Twitter, Khamenei called for the atomic energy organization to begin preparations "tomorrow." The call for enrichment seemed to be a warning to European countries that they must not abandon the deal and expect Iran to be passive. President Donald Trump announced on May 8 that he was pulling the U.S. out of the agreement. "It seems from what they say that some European governments expect the Iranian nation to both put up with sanctions and give up its nuclear activities and continue to observe limitations [on its nuclear program]. I tell those governments that this bad dream will never come true," the Leader said. The move is the latest Iranian response to Trump's move and was coupled with a vow that Iran will continue its missile development, calling it "a source of power." "Today the young generation has made Iran the No. 1 missile power of the region," Khamenei tweeted. "Our enemies know that if they hit us with one missile, they will be hit by 10 of them! Missiles are for security, they're a source of power." Today the young generation has made Iran the #1 missile power of the region. Our enemies know that if they hit us with one missile, they will be hit by 10 of them! Missiles are for security, they're a source of power. The lack of limits on missile range and production has been cited by the Trump administration as one of the nuclear deal's flaws. The JCPOA was restricted to the Iranian nuclear program and did not address ballistic missiles or other issues like Iran's purported role in international terrorism. U.S. intelligence officials have suggested that Iran's missile programs are proceeding without limitations. "Iran continues to pursue the development of more powerful space launched vehicles," a senior U.S. intelligence official told NBC News recently. "In 2017 Iran launched a liquid-propellant missile called the FIMORGH which could be capable of intercontinental range." Such a development would put the U.S. within range of Iranian missiles. A second U.S. official pointed to a recently disclosed missile engine test facility in Shahrud, east of Tehran, that is run by the Self-Sufficiency Jihad Organization of Iran's Revolutionary Guard. Although Iran has claimed the site is for development of space launch vehicles, the official asserted that it is also dual-hatted as an ICBM development site. "They are developing missiles there with a suspected range of 13,000-15,000 KM – a range that could hit the U.S," he contended. The U.S. is also concerned that Iran may use its missile program to intimidate its Arab neighbors. Tensions between Iran and the Arab states, particularly Saudi Arabia and the United Arab Emirates, has grown in recent months. Khamenei encouraged the young people in Arab states to stand up against their leadership. "Young Arabs, you should take action and the initiative to control your own future ... Some regional countries act like their own people's enemies," he said.